Water damages floors, expecially wooden floors. And gyms are full of wooden floors. 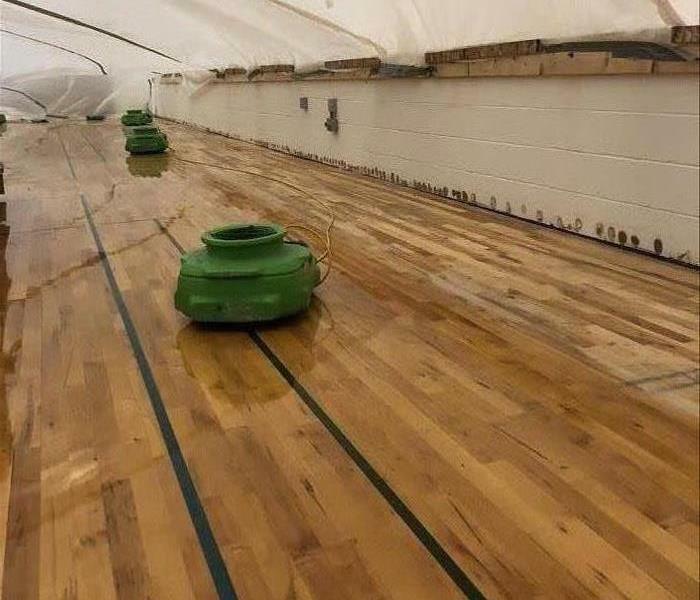 When this gym flooded, they called SERVPRO to remediate the situation. SERVPRO used their expertise, training and equipment to remove the water. 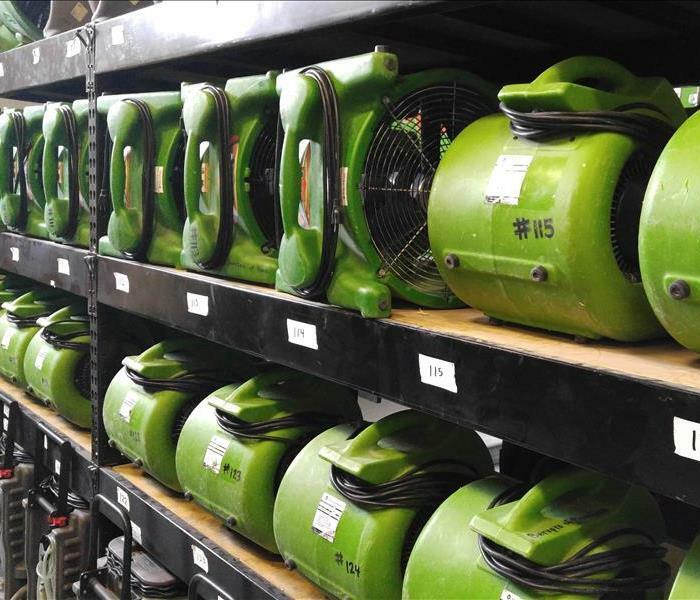 This picture is of air movers which were stragically places to increase the air circulation and speed up the drying time. 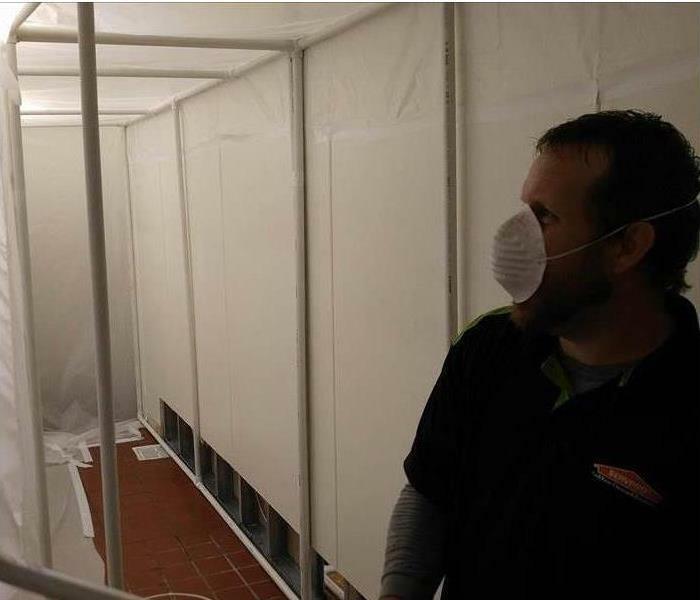 SERVPRO of Provo recently remediated a business property after a fire. Smoke adhered to the screws in the walls and onto the ceiling. You can see this where there are the darker circles along the studs. Contact SERVPRO if your business has suffered from a fire. 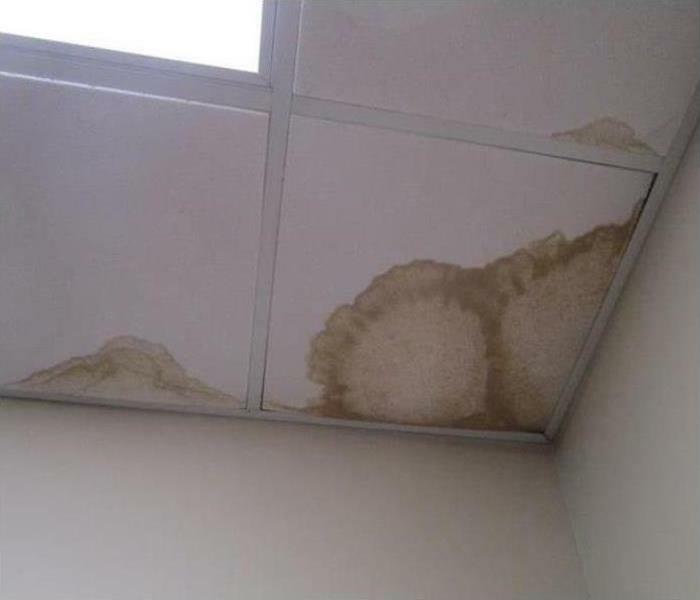 When a roof gives way during a storm, the rainwater can severely damage interior structures as shown in the Provo Photo. SERVPRO, We're Faster To Any Size Disaster, responds quickly to mitigate the damages and help our neighbors. We are just a phone call away. 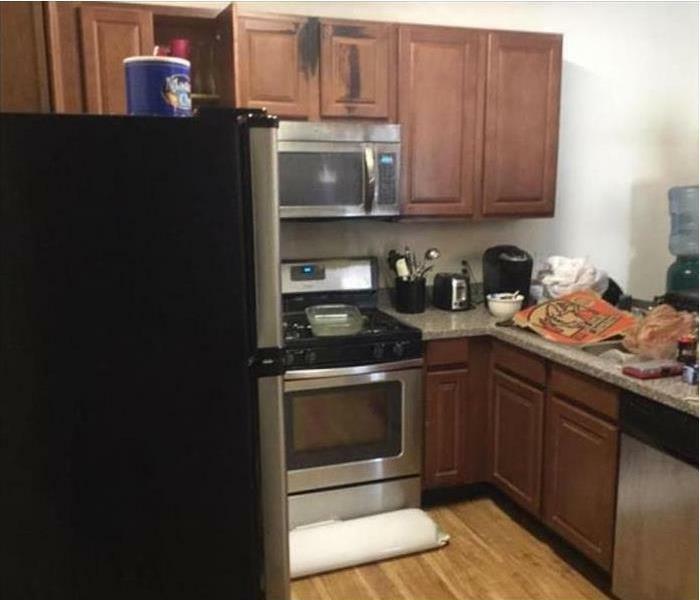 Our SERVPRO team responded quickly to the washing machine malfunction in this Spanish Fork laundry room. The pressurized water flooded the sheet vinyl flooring. After suctioning out the standing water, we made a partial demolition. We removed the baseboards and punched weep holes to escalate the drying of the wall cavities as our air mover enhanced the drying of the plywood subfloor. 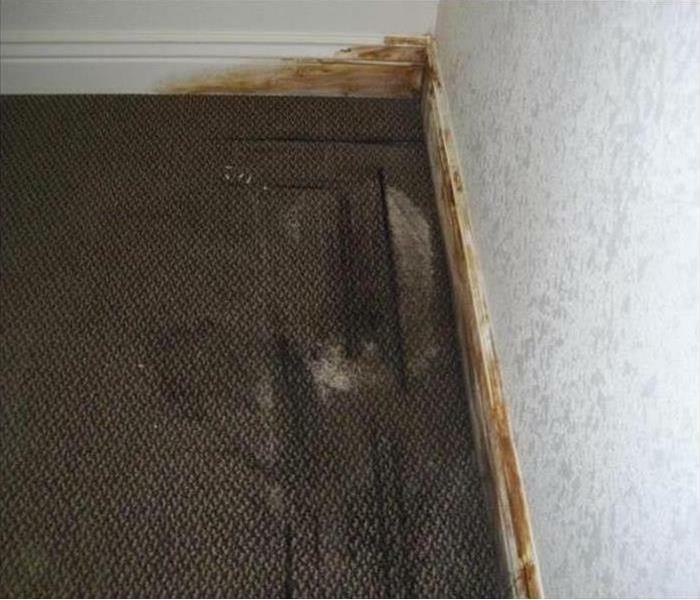 By working hard, our SERVPRO crew minimized the water damage and prevented secondary damage like potential mold growth. Of course, our Spanish Fork customer was pleased with the outcome, minimal disruption and cost along with the work time. Got Mold Under Your Furniture? SERVPRO recommends moving that heavy furniture you have around your home several times a year to make sure you don't have any leaks anywhere that may be causing mold to grow in your home. 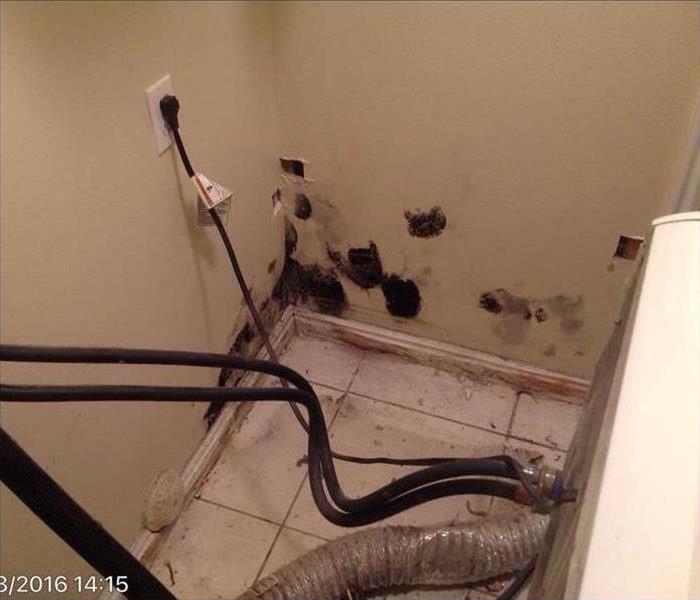 This is something we frequently see, a homeowner has no idea until it is too late and mold is already growing. 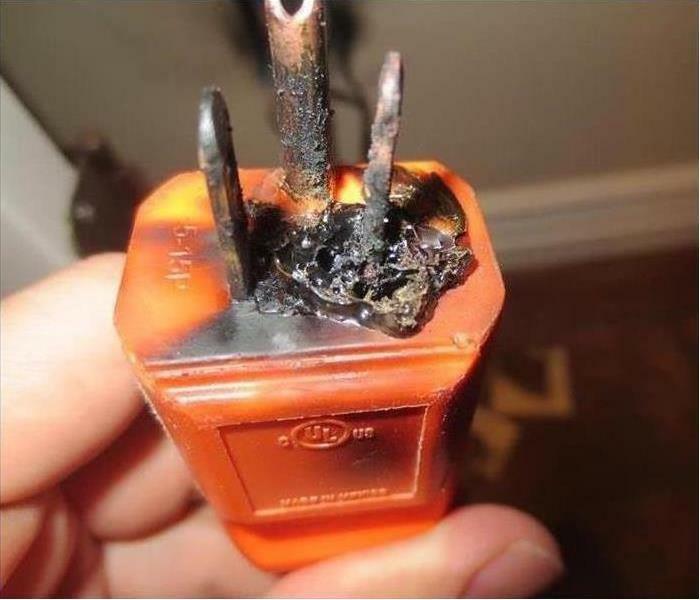 This may not seem like anything dangerous but if not plugged into the correct type of outlet it is VERY dangerous! Make sure you have all your cords plugged into an outlet that is equip to handle the voltage of your cord. 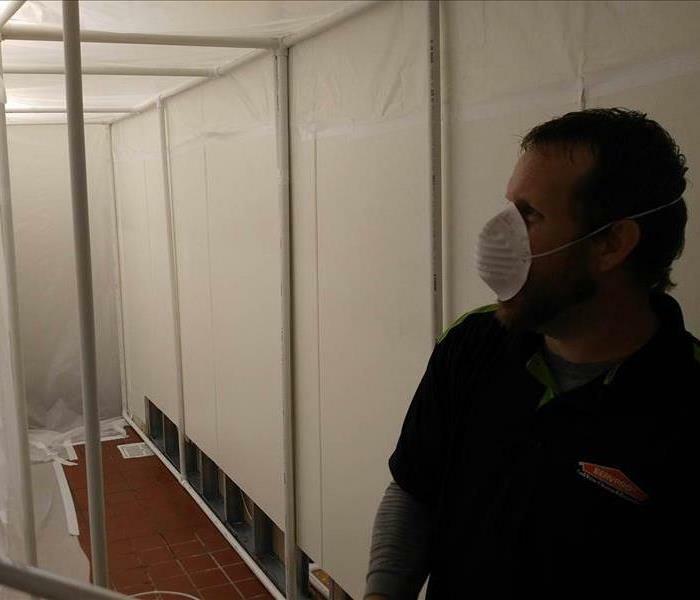 Here's "T" hard at work in a containment set up for a large commercial mold job. The spore count was so high that containment needed to be set up for almost every square inch. The moral of this story is to make sure your garden hose does not get left in in a window well. That is what happened to this family's home. Unbeknownst to them their garden hose has been left on a little bit and slowly filled the window well to the point it leaked inside the house. 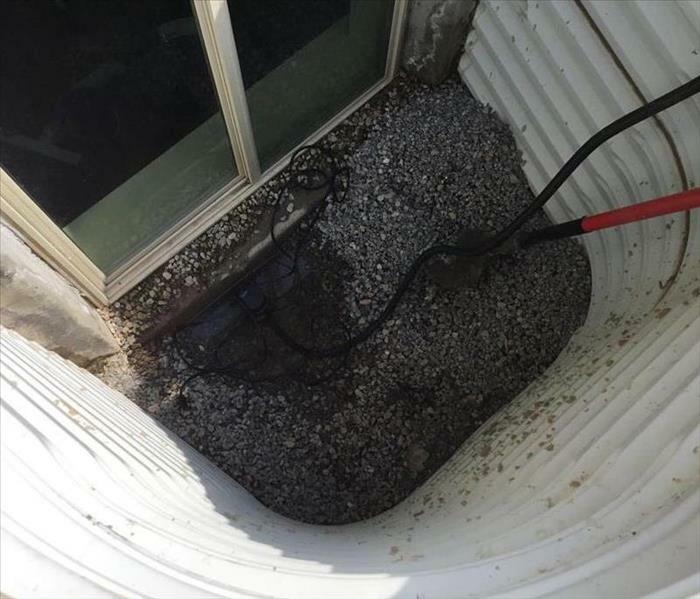 The ground surrounding a home in American Fork, UT was not quite as dry as they owners thought. They had been watering their lawn too much and the water has gone through the cement foundation causing wet drywall and lots of mold. 3/4 of the walls in the basement needed to be pulled out and replaced. A family in Orem, UT came close to losing their home after the fireplace in the family room caught fire. Luckily the family was home when the fireplace caught fire and they were able to call 911 immediately before the whole house was in flames. While their home still had a lot of damage they feel blessed they still have home. Hurricanes aren't just dangerous but also very dirty! Hurricanes make a muddy mess. A hurricane can cause a lot of exterior damage to a home but also make quite a mess inside your home. This particular home's bathroom window was broken from the storm and filled with dirty, muddy water. SERVPRO has the knowledge and equipment to get your home cleaned up in no time! Rain fills window well and floods basement. A severe rain storm caused basement flooding for many people in Provo, UT. 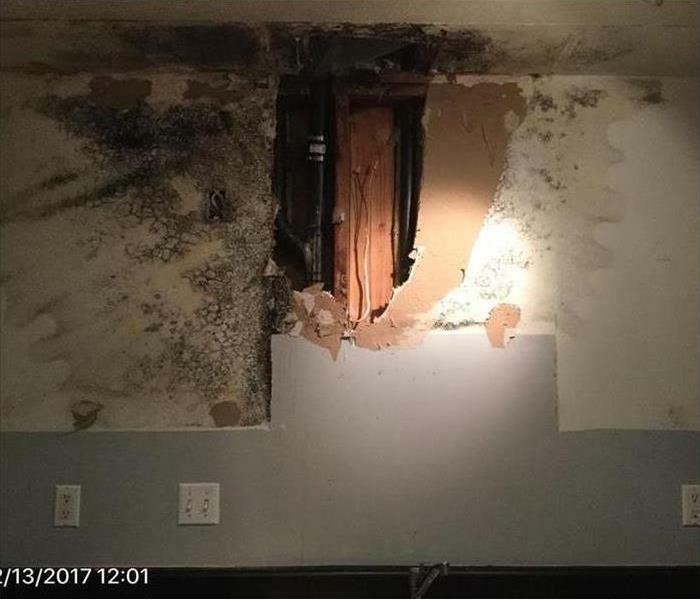 This particular home was flooded due to the window well filling with water and leaking through the window and into the house. Luckily the homeowners were home and were able to call SERVPRO before the damage was too extensive. A glycol heater burst into flames in a commercial warehouse causing extensive damage to the building. The explosion blew was big enough to blow the door off the heater. The walls and insulation were covered with soot and the building filled with smoke cause a lot of things to need to be replaced. 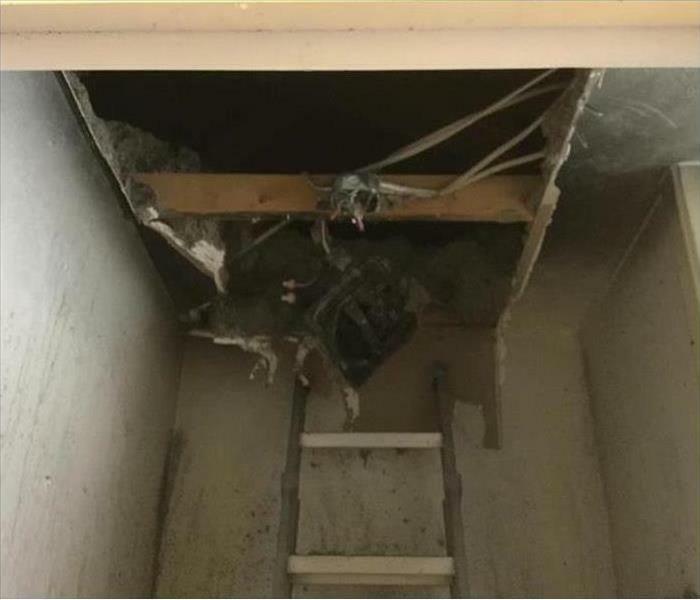 A broken pipe in a salon located in Springville, UT caused quite a bit of damage. The leak effected the flooring, baseboards, and unfinished basement. 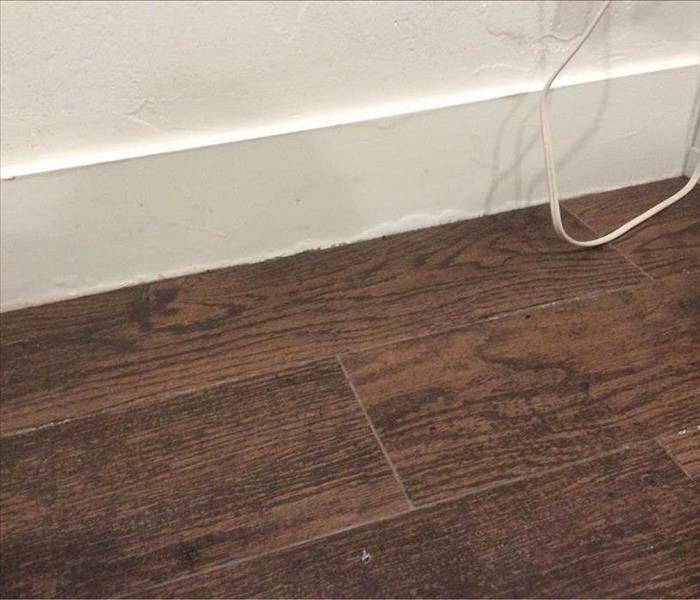 The floor was able to be dried and saved but the paint on the baseboards was bubbled and they were warped and hard to be replaced. If your business ever experiences a small fire and the fire sprinklers go off you are left with a mess. 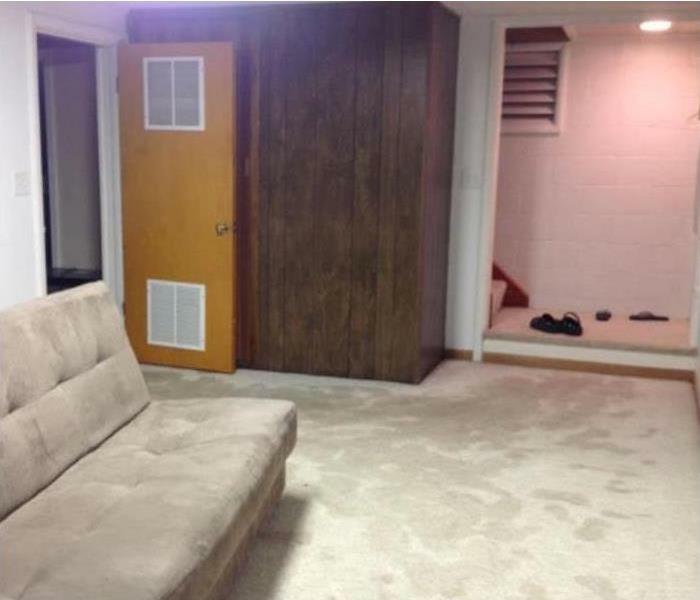 SERVPRO will come and clean up the mess from the fire AND the water damage. We will extract the water and start the drying process with our air blowers and dehumidifiers. 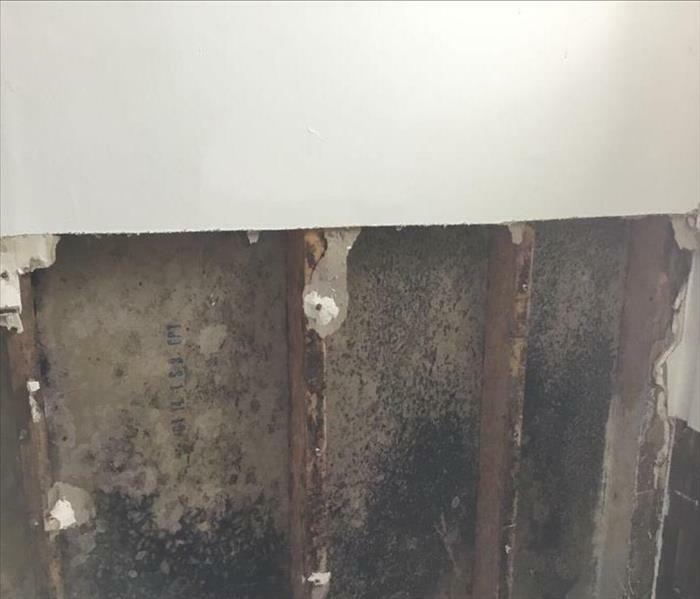 Over time a small water leak in the wall behind the kitchen cabinets caused a lot of mold growth. After the leak was discovered the cabinets were pulled off to fix the leak and the mold was discovered. The dry wall needed to pulled out and rebuilt before the cabinets could be replaced and put back on the wall. A flat top stove in an Orem, UT home caught fire and caused some smoke damage to the surrounding kitchen ceiling. Luckily the fire was extinguished quickly and did not start anything else on fire but not before but the ceiling did have smoke damage. 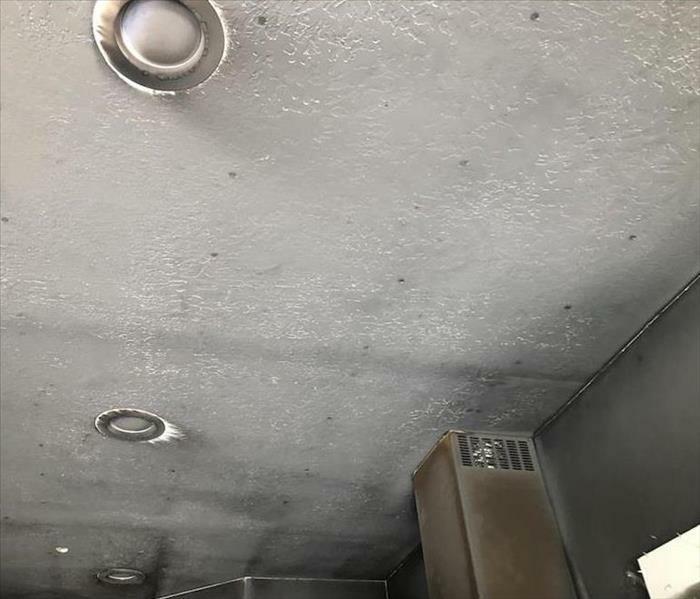 Smoke damage isn't anything that SERVPRO can't clean up in a jiffy. 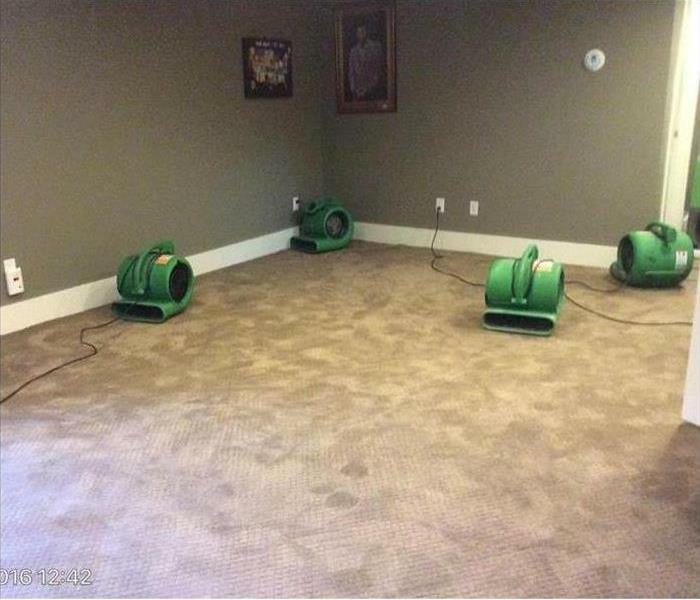 If you have ever experienced a flood in your home you know how long it can take for your carpet to dry. SERVPRO can help with that! 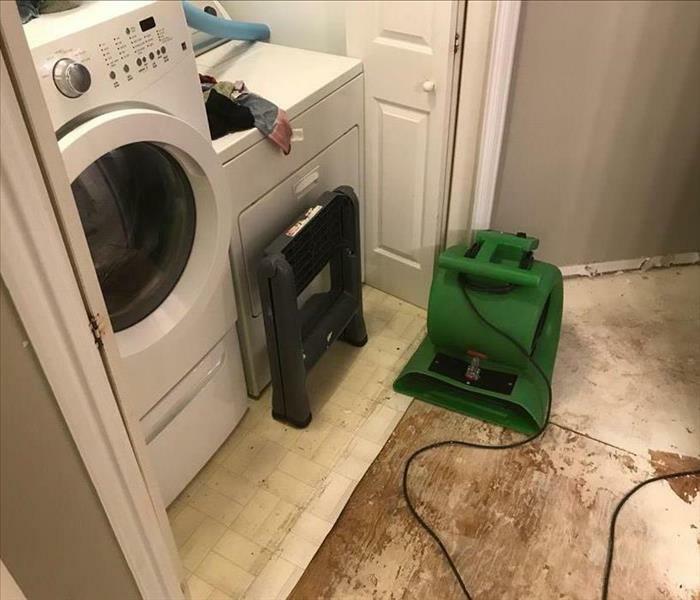 Give SERVPRO a call and we will get the water extracted quickly for you and we will set up air dryers throughout the affected area and leave them at your home working until the moisture is all gone. Our customers are always pleased with the quick thorough results SERVPRO can offer. A leak in your wall can get bad really fast. A lot of times homeowners may not know they have a water leak until it is too late. If you suspect you have a leak please check into asap and if you have a leak that has caused damage and mold give SERVPRO a call! A small fire that was started by a bathroom fan in a Provo home was extinguished quickly but still caused a lot of damage. The homeowners called their insurance agent and he referred them to SERVPRO. He guaranteed SERVPRO's work and we did not disappoint. We got to their home that day to start the restoration process and give them peace of mind. Next time you have a flood give SERVPRO a call. Sure you can spend the entire day (or longer) sucking water out of your carpet with your shopvac or you can call SERVPRO we can have the water extracted within a couple hours and the carpet dry by the end of the day! 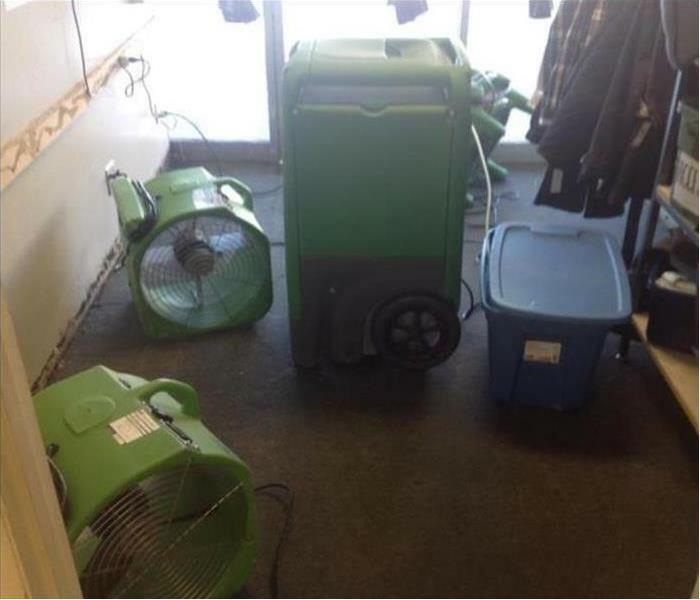 If your commercial business has had water damage you may need more than a few fans blowing air to get your business dry before the moisture begins to cause damage. SERVPRO is here for you. We can bring it to your location and get you all set up and your business dry in no time! Have you ever wondered if that water the sneaks out of shower from the side of your shower curtain is doing any damage? The answer is yes! This bathroom in a home in Lehi is proof. The water made a big moldy mess underneath the linoleum but luckily SERVPRO was able to clean up and remove the mold. Now looking at it you would never even know it was there. After a small cooking mistake this range in a small apartment in Saratoga Springs was ablaze. As the flames grew and the smoke spread it caused some major damage. 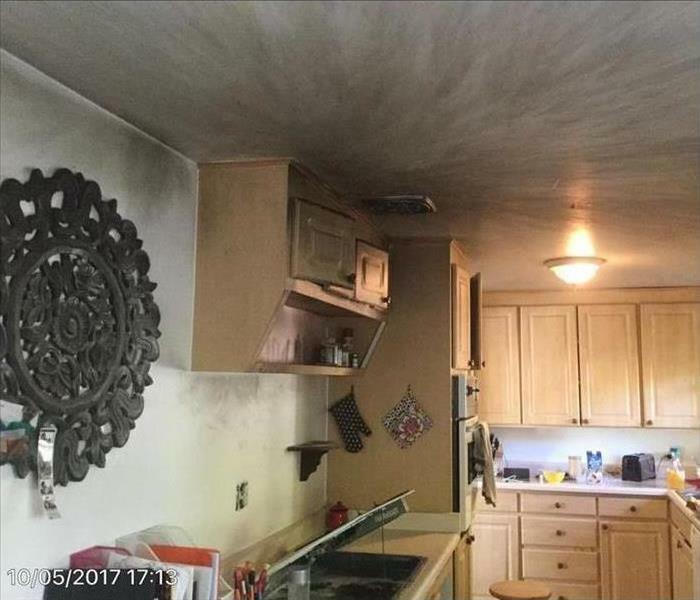 By the time the fire was out the smoke damage was extensive, there was soot covering all the cabinets, and it has set off the fire sprinklers. The smoke and soot was cleaned up quickly and easily by SERVPRO, but the fire also set off the fire sprinklers in the apartments on the above floor and below floor causing them water damage and loss. 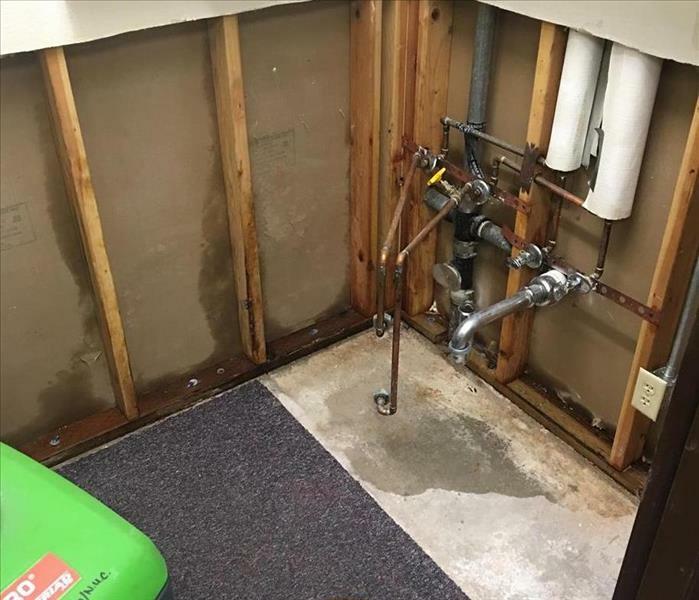 When SERVPRO of Provo was called in, it was discovered a water heater under a sink malfunctioned sending water into surrounding rooms. SERVPRO mitigated the water damage, replaced the old water heater, and rebuilt the cabinet. As you drove the streets of Houston, Texas and surrounding cities the streets were lined with those affected by Hurricane Harvey possessions. The Hurricane created severe flooding that filled and destroyed so many homes. Since the water damage was from flood water which is categorized as category 3 "Black Water" meaning the water is extremely dirty and possibly dangerous, anything that the water damaged needed to be discarded. Due to the amount of damage and homes affected the garbage processing plants were full and the residents had no choice but put all of their destroyed possessions outside on the streets until they were able to be picked by the sanitation department. SERVPRO of Prove is always there to lend a helping hand. Hurricane Harvey devastated the Houston, Texas area in late August. Many homes and business were affected and had severe damage and extensive loss. Unfortunately this home was affected and main level had to be gutted from 4 feet down to the floor. 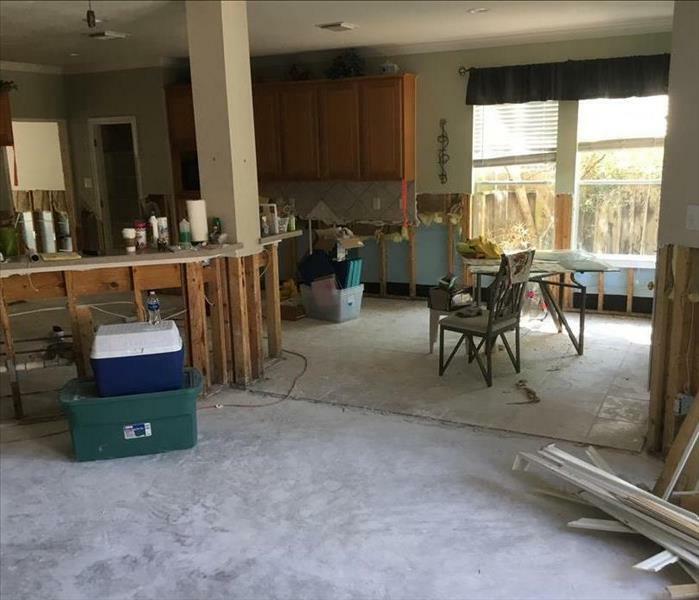 SERVPRO of Provo was able to go in, clear out all their destroyed possessions, take out all the flooring, do a 4' flood cut on the walls, and clean the affected areas to prevent mold before the owners began to rebuild. 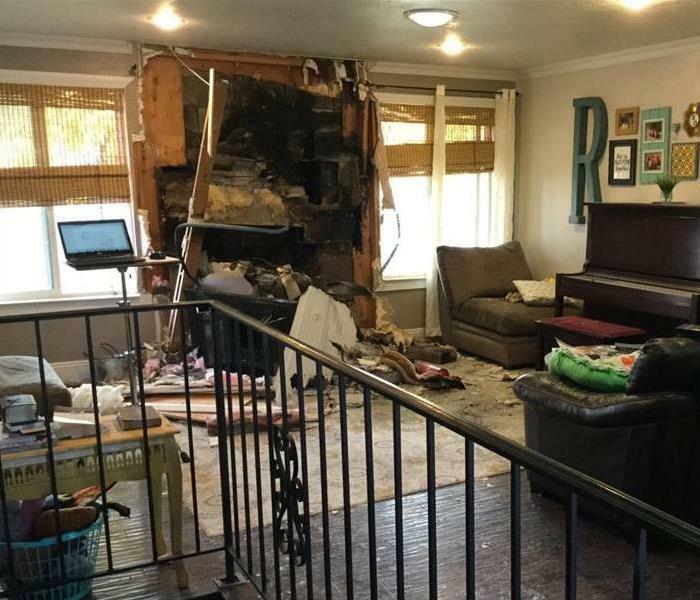 This house fire in Provo, originated from a parked car inside the garage. 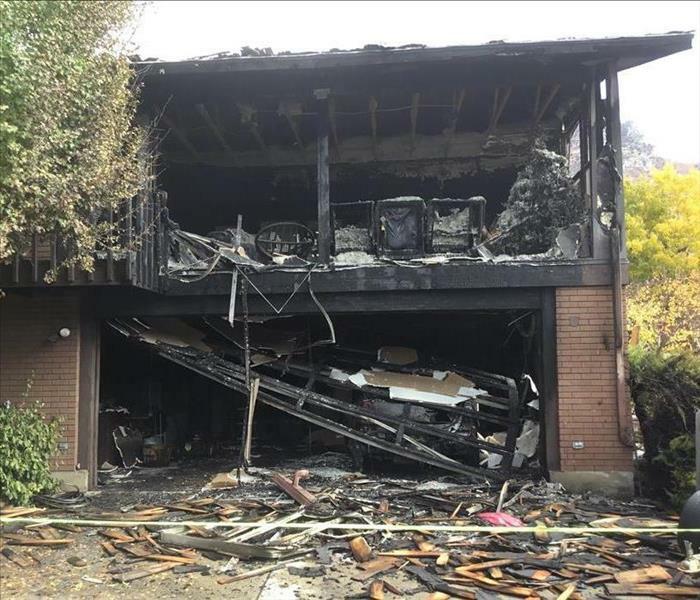 A cellphone charger was charging a cellphone malfunctioned, and sparked a fire which engulfed the car, garage, and the room directly above the garage. The house also sustained heavy smoke damage. The owners of the house called SERVPRO of Provo and we were able to get to the home and help with the mitigation and clean up process. 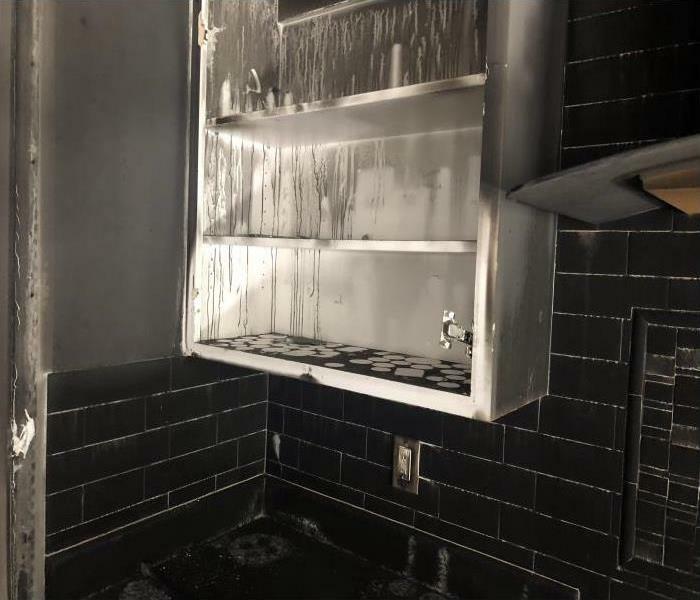 Inside an LDS church in Provo, Utah some vandals discharged the Fire Extinguishers leaving a huge mess. 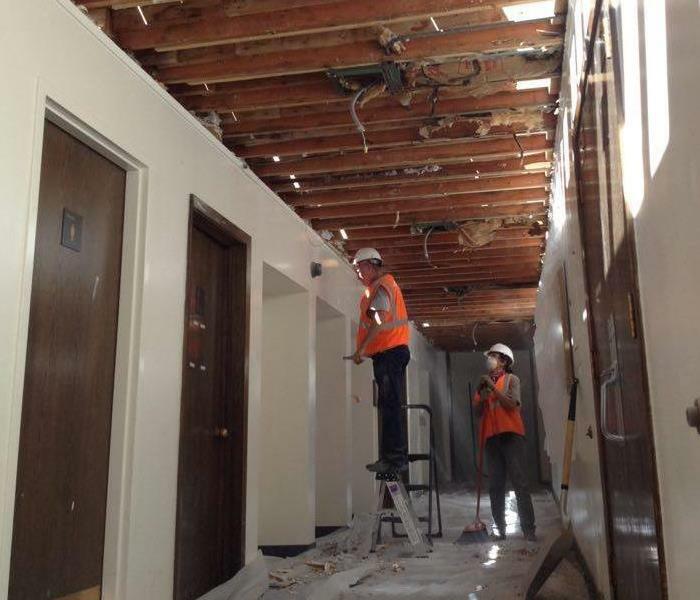 SERVPRO of Provo was called in for the job and did an excellent job of cleaning up the mess and damage caused. 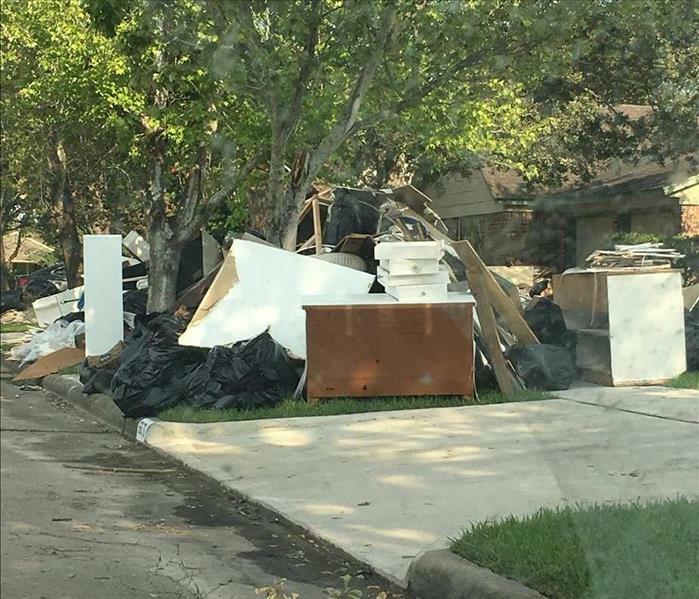 Afterwards you could say is was "Like it never even happened"
Hurricane Harvey hit Houston Texas at the end of August and left a trail of damage in its wake. 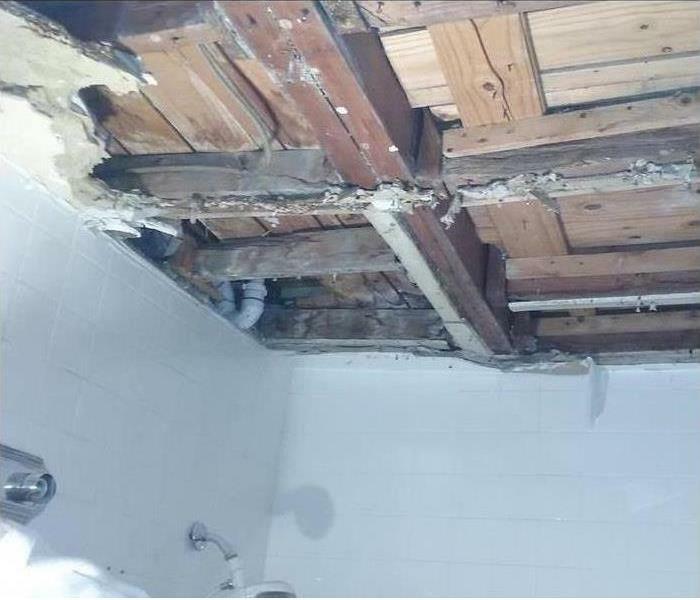 The interior of this home was covered with standing water for nearly a week before SERVPRO of Provo was able to get in and clean up the mess and start to repair the damage. Hurricane flooding brings in Category 3 Water (black water) which is grossly unsanitary and may contain harmful bacteria and fungi. 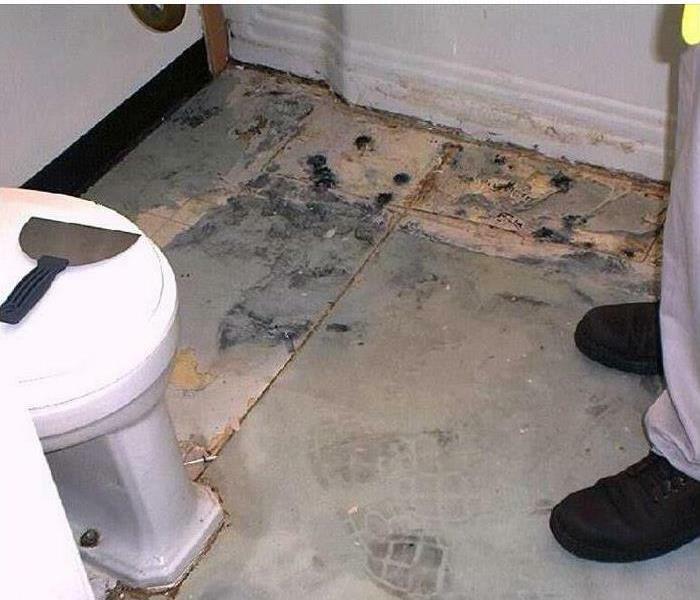 The contents of the home had to be cleared out so all the flooring could be removed and the walls could be flood cut to remove any danger of mold, fungi, and bacteria that may be harmful and cause more damage. SERVPRO of Provo did an excellent job of cleaning up the mess and getting the home ready for repairs. This bank shared it's walls with a butcher shop that would hose down it's floors on a nightly basis. Hundreds of butcher floor washings later, this bank had one of the highest mold spore counts we'd seen in a long time. No problem for SERVPRO. SERVPRO of Provo understands how important and costly business interruption can be due to circumstances out of your control. It is our goal to minimize down time on all disasters regardless of the size so that you can get back to your normal routines. We help you take control back and make it "Like it never even happened"
When it rains, it pours right? This church was in the middle of getting its roof replaced when we experienced one of the biggest rain storms of the year. Result, soggy insulation, sagging ceiling tiles and an overall mess. No one plans on a disaster so it is never convenient. But when water damage happens to your home or business SERVPRO is ready to help you take control. 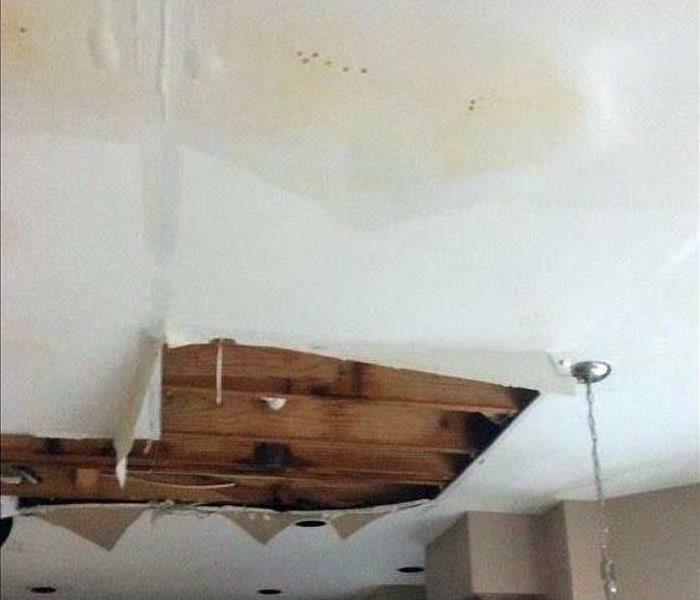 We at SERVPRO have experience in all types of water damage problems. 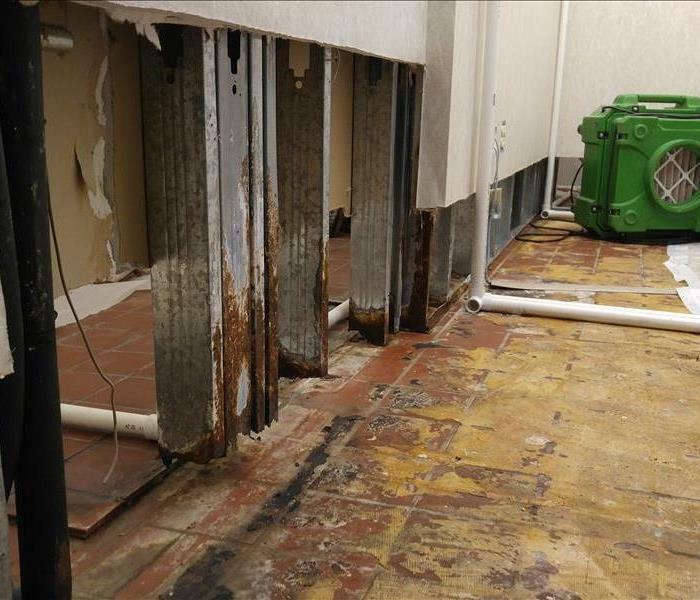 No matter the size large or small SERVPRO can perform water extraction services and continue the drying process to like make water damage "Like it never even happened." There is no disaster that we can't handle. 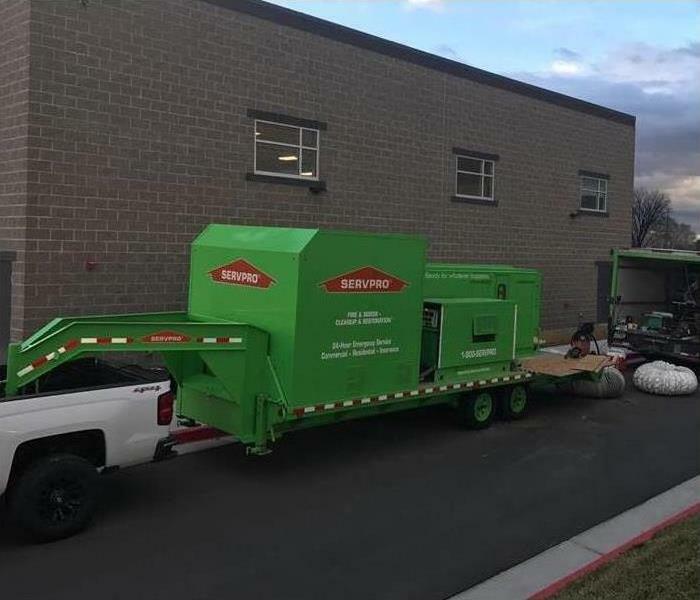 SERVPRO of Provo / N. Utah County has the equipment and the expertise to handle anything that misfortune or mother nature can throw your way. SERVPRO of Provo offers free classes to insurance agents wanting to earn credit hours. 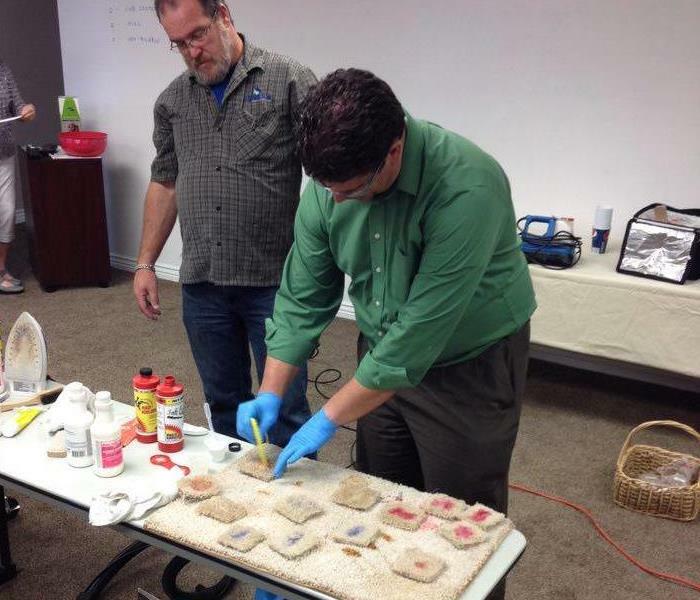 These classes cover a variety of useful subjects from Ethics, Mold, Water and Fire Damage, Odor Removal, Subrogation, Emergency Preparedness to name a few. SERVPRO of Provo also provide Continuing Education for Real Estate Professionals in Utah. If you need continuing education credits for your professional licensing contact us we have classes at our location or we can schedule a time to come to your office and provide classes for your staff. All at not cost to you, we love educating our community.